The Summit Limited embodies all the balance, quick handling and accurate performance qualities of the popular Summit Sporting and adds a deluxe grade of oil finished, hand rubbed Turkish walnut with a richly colored case hardened receiver to create a stunning sporting over/under. The same weight, feel and clay crushing performance of the standard Summit Sporting are inherent features of the Summit Limited. 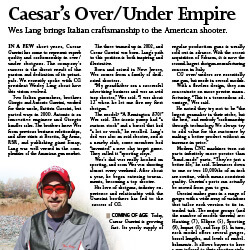 The 12-gauge version incorporates Caesar Guerini’s new Maxis Bore barrels and Choke System for enhanced performance. This new barrel incorporates a .735 bore diameter with a longer choke system calibrated to the larger bore. The 12 gauge stocks have also been reconfigured to offset the slight increase in barrel weight. The 12 gauge models are offerd in 30, 32, or 34 inch lengths while small gauge models are available in 30 and 32 inch. A two-barrel 20/28 gauge combo set is available as well as a three-barrel 20/28/.410 set. Avg. Weight** 7lbs. 14oz., 8lbs. 7lbs. 6oz., 7lbs. 8oz. 7lbs. 6oz. 7lbs. 8oz.